The Townes at Bluestone will soon feature a new floor plan -- with construction starting in the next few weeks. Both styles above featured a bedroom level with a master suite and then two smaller bedrooms and a second bathroom. These new "loft" floor plans will feature two large master suites on the bedroom level, plus a third level loft that could be a third bedroom (with optional bathroom), or a play room, or exercise room, or office, or so much more. Explore the pricing and floor plans for these new townhouses here. Money continues to be cheap. Mortgage money, that is. The average mortgage interest rate fell again (slightly) to 3.71%, after having risen for a few weeks. This is a good bit below the 12 month average of 3.853%. And, notably, interest rates continue to be below 4%, as they have been for most of the past year. This is still a great time to lock in your long-term housing costs! Do you think kids should be active, playing outside, riding bikes (among other things)? I do. As such, I am supporting the ShenRock Mountain Bike team by purchasing a raffle ticket to win the bike pictured above. The raffle is being run by Bluestone Bike & Run -- a local bike shop and running store. Check out the raffle here. 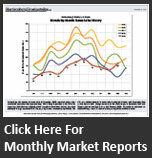 You can now access market reports back to 2013 by visiting HarrisonburgHousingMarket.com. Whether you are looking for the most recent report, or if you are interested to see how things were looking a few years ago, you are welcome to explore them all. Also of note, the best ideas for additions to my monthly market reports come from YOU! If you have further questions about our local housing market that are not covered by my monthly market reports, let me know! After quite a few years of somewhat slower home sales over $500K, the pace of these higher end home sales jumped up in 2015 to 29 home sales -- the highest pace seen since 2008. If we raise the bar a bit, and look at home sales over $600K, we see that this slightly narrower market is looking quite strong -- a jump up to 19 home sales over $600K in 2015. This is the highest level seen since 2006. And finally, wow, the most dramatic change is in the $700K+ price range. There were 11 homes sales over $700K in 2015 -- which is more than were seen in the sum of the four years -- and is the highest number of $700K+ home sales ever seen in Harrisonburg and Rockingham County. Stay tuned to see how these market segments perform in 2016. Explore homes for sale over $500K by visiting HarrisonburgLuxuryHomes.com. Big news for off road biking enthusiasts! Development and construction of a new bike park are underway, with a mid-summer opening date. And....wait for it....it will be served by a bike lift. Ride the lift to the top, with your bike, and race on back down! The chart above is calculated based on comparing the 2015 median sales price to the median sales price in each of the prior 15 years. For many, many home owners, this chart may have very little pertinence to the value of your home. These calculations are based on median sales prices, and your home (and/or neighborhood) may have performed VERY differently during any of these time periods. If you bought your house between 2005 and 2010, while your home might be worth less now, you have (hopefully) paid down your mortgage to the point that you could sell without bringing money to closing. If you bought in 2004 or prior, or in 2010/2011 or after, you should do just fine if you are selling today. But again, the most important point is that while this might provide a general guide to what has happened with home values over the last decade (+), every home and neighborhood is unique. Let's chat about your specific house if you want to know what it is worth in today's market. If you are purchasing a home, before you call the listing agent to see that home, you should understand a bit more about buyer representation. Virginia requires me to have a written agreement with any buyer to whom I provide any real estate advice or counsel. You can work with another Realtor in my office to fully represent you as a buyer. I can continue to represent the seller as a client, and work with you as a customer. In Option #2 above, I cannot advise you on negotiations, repairs, or in a dispute. Each year, I have multiple buyers who choose each option. Some buyers choose Option #1, because they want advice and guidance on pricing and negotiations. Some buyers choose Option #2, because they intend to make all negotiating decisions independently. If you decide you want to purchase one of my listings, we will discuss and determine a new game plan. Of note - my compensation for representing you will be paid by the seller's real estate company or by the seller. The buyers are coming, the buyers are coming! As you can see, above, buying activity starts creeping up as soon as February, more so in March, and APRIL is the third hottest month of the year for buyers to be signing contracts. Home sales remained level in February 2016 (as compared to Feb 2015) but increased 15.38% when considering January and February of this year as compared to 2015. The median sales price has risen 9.76% over the past year when comparing January and February data -- though a 3.39% increase when considering a 12 month time frame is likely a more realistic view of changes in market values. Homes are selling more quickly -- with the median days on market declining 13.25% to 72 days when looking at January and February of this year versus last year. February was right on target at 68 home sales -- and we are likely to see a similar number of home sales in March. Wait until April, however, and homes should really start flying off the shelf. The pace (and price) of single family homes are often a good way to understand the overall trajectory of a local housing market -- because it takes rental properties (and the impact of investors) out of the mix. As such, it is good to see the price of these home sales increasing (quite a bit) even if the pace of sales has not significantly increased over the past few years. Inventory levels are still hovering around 530/540 -- but are on the brink of increasing significantly, which will likely happen over the next 30 to 60 days. Hang on tight! BUYERS -- You should have plenty of additional options to consider in the coming months, but houses that are priced well will likely sell quickly. Strike while the iron is hot -- and relish the opportunity to still have super low (sub 4%) fixed mortgage interest rates. No holds are barred in the pitched battle for presidential nominations in the party primaries. Every channel of media is filled with candidates on both sides of the aisle pointing out how government has failed, and promising that unless they are elected, America will fail. Amidst such a negative barrage, it is wise and refreshing to remind ourselves that government can be a positive force. We need look no further than home. The successful and ongoing revitalization of Harrisonburg's urban center demonstrates clearly how government, with the involvement of private sector forces and engaged citizens, can play an enormously positive role in improving our American quality of life. You may have seen that Harrisonburg Downtown Renaissance recently celebrated the blossoming of economic activity downtown by welcoming a new leader and celebrating the accomplishments of its founding director ("Bumbaugh Honored As ‘Downtown Hero,'" Feb. 23). Former City Council members who voted 13 years ago to create HDR attended this celebration for Eddie Bumbaugh. At the time of the historic vote, the City Councils Republicans and Democrats agreed that funding the recovery of our local identity and bringing economic growth to a blighted and forgotten downtown district was a good idea. They knew risk was involved. Yet, ultimately their wisdom and bipartisan agreement to improve our city is without doubt a convincing testament to how government can be a positive force. Once a place to avoid, downtown was filled with crumbling sidewalks, worn buildings, vacant storefronts and faded pride. When council approved funding for HDR, many residents believed it was a mistake, that downtown was a lost cause. Today, it is Harrisonburg's heart. For the last six years, the Daily News-Record's Annual Reader's Survey proclaimed downtown the best use of taxpayer money. For five years, the same survey named downtown the best thing about Harrisonburg. Since HDR began operating in 2003, 250 historic preservation projects have been completed. The number of downtown dwellings has grown from 150 units to 550. Twelve restaurants were downtown in 2004. Today there are 35. Private investment in downtown through the last 13 years totals $66 million. And, downtown Harrisonburg received the National Main Street Center's "Great American Main Street" award in 2014 — recognizing our community as a model for others throughout the U.S. to follow. Of course, the city's decision to fund HDR is not solely responsible for downtown's success. And this is the key point. That success is shared among the developers who, working in the free market, purchase and refurbish decaying buildings; restaurateurs, artists and retailers who open businesses; volunteers who donate precious time to planning committees and events; and donors who contributed their hard-earned money. When council voted to fund HDR, our community got the kick-start it needed to get the public and private sectors working together. Such positive action can happen at any level of government — municipal, state and federal. Government, citizens and the free market working together with a clear set of objectives can accomplish great things. This has always been true, and it is a distinctly American mode for advancing society and improving everyone's standard of living. It's the core of how America became history's greatest nation. As you watch the increasingly negative depictions of government during this especially distressing presidential campaign season, remember, the rhetoric is nonsense. Our system of government can work very well if we the people stay positive and involved. Andy Perrine is president of Harrisonburg Downtown Renaissance. If this year is like last year (and just about every year, ever) buyers will have many more choices in coming months. As shown above, inventory levels are likely to steadily increase over the next three to their peak in June. If you are hoping to know about every new listing, as soon as it hits the market, check out NewListingsInHarrisonburg.com where you can sign up for email alerts for new listings. Do you have plans this evening? If you missed seeing "The Big Short" at Regal Cinemas, maybe you should make a point to catch it at Court Square Theater over the next few days. I haven't seen the movie yet (I plan to see it at CST) but I have heard that it does a fantastic job at explaining how the housing bubble created a financial crisis in 2007/08.